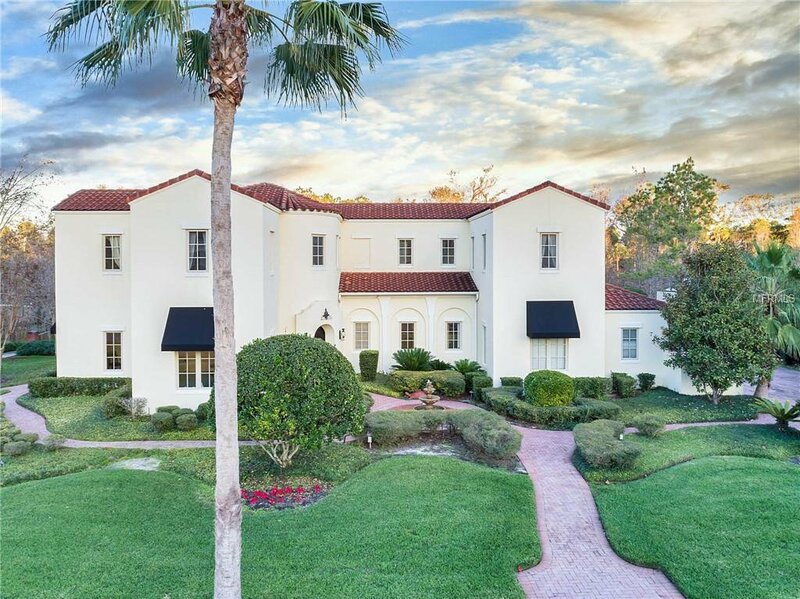 Incredible Opportunity To Own This Beautiful Custom Mediterranean Estate Set On A Stunning Backdrop of Water And Conservation Views Located On Celebration’s Coveted Eastlawn Drive - Just 12 Minute Walk To Downtown Shops & Restaurants. Built by Derrick Custom Homes In 2005, Seller Has Added A Magnificent Resort Style Pool With Lush Landscaping, Fire Pits, Water Features and Extended Non Slip Tiled Lanai. Ride The Full Size Elevator To Upstairs Media Room With Projector And Screen, Custom Built-Ins, Shelving, Bar, Music Room/Study or 6th Bedroom. Custom Upgrades Throughout. Come Home To Over 5,400 square feet of living space designed over Two Levels. Spacious Downstairs Master Suite Which Showcases The Master Bath with Dual Vanities, a Spa-Jet Tub and Separate Walk-In shower With Dual Shower Heads. French Doors Open To Pool Oasis and Lanai With Lake Views. Reinforced Walk-In Closets And High Ceilings With Surround Sound Built In Speakers. Chef’s Dream Kitchen Includes Large Center-Island Kitchen Boasting Granite Countertops Paired with Stainless Appliances By Viking, Miele and Thermador With Custom Wood Cabinetry – All Overlooking the Breakfast Nook and Family Room With Built-In Media Display. Serve Dinner To Your Guests On Side Patio Or Huge Rear Pool Area. Half Acre Lot With Generous Paved Driveway And Oversized 3-Car Garage. Fenced In Rear Railing - This Home Has It All - Location, Large Custom Floorpan, Incredible Views With Sunsets To Front And All Day Sun To Pool And Priced To Sell! Listing courtesy of TONYDAVIDSHOMES.COM, LLC. Selling Office: REGAL R.E. PROFESSIONALS LLC.